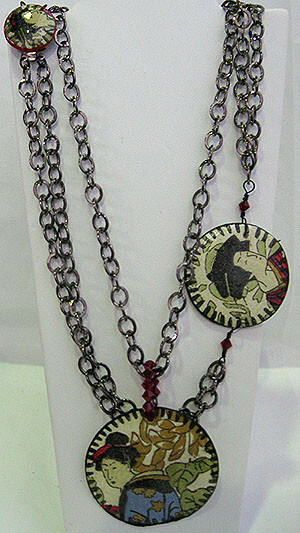 The necklace ( inches long) is made with Gunmetal chain. 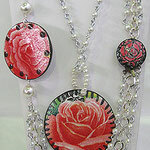 The images on the necklace are hand decoupaged onto Shell 50" Rounds. 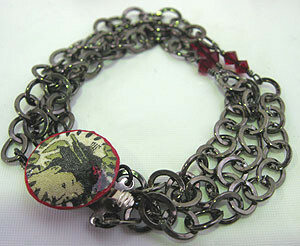 The bracelet has a decoupaged clasp. 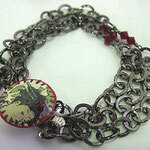 We added garnet Swarovski crystals to complete the ensemble. 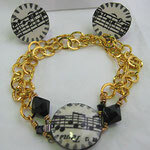 This necklace is made with 50" decoupaged note pendants. We used the same note images on the clasp on the bracelet. 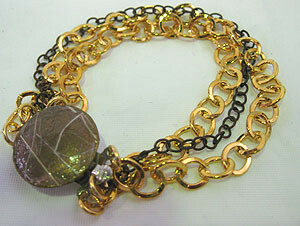 Swarovski crystals are used to complete the necklace and bracelt ensemble. 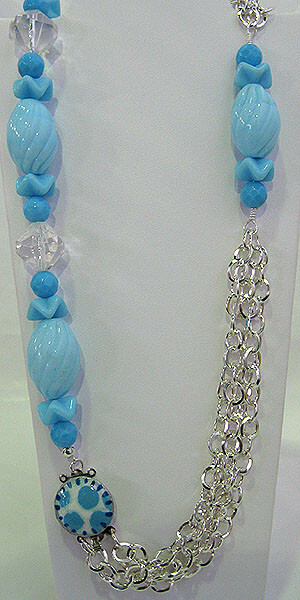 Although this necklace has a young feel we used all vintage baby blue beads and our usual decoupaged shell 50"pendant. 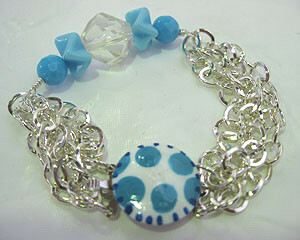 The bracelet has matching beads and matching clasp. 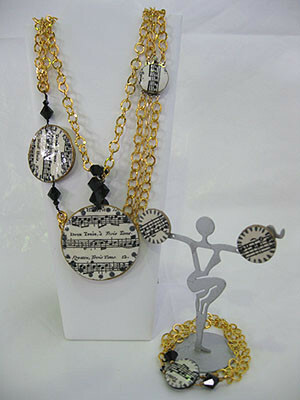 We call this necklace set "I Love Lucy". 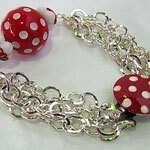 The vintage red and white polka dots beads are from the fifties. 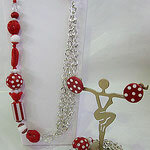 We used coordinating vintage red and white beads to continue the theme. 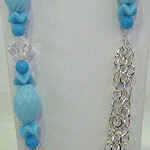 Check out the matching earrings and bracelet. 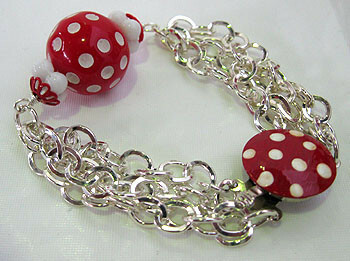 Wanna really go retro we have a matching "I Love Lucy" handbag in our "Vbox" section. 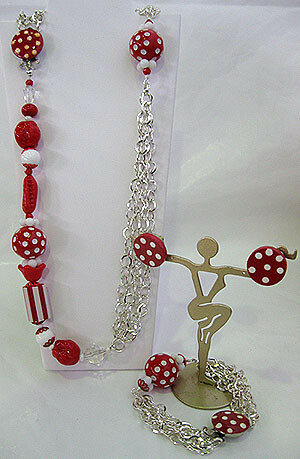 We created this necklace set to match our "Vbox" necklace "Paris. 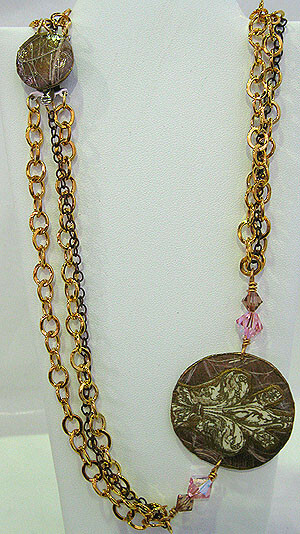 The delicate mix of our fleur de lis pattern on our 50" shell pendant flanked by delicate Pink Swarovski crystal complet thie necklace. 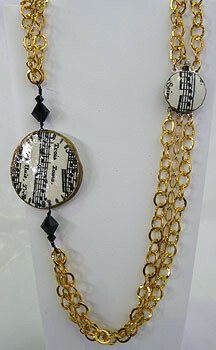 We used mixed metals for the chain on this one. 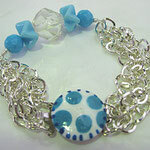 Matching bracelet and earrings complete the set. 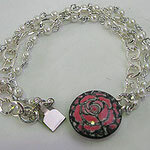 A rose is simply not a rose and when you wear this necklace and bracelet you will wear triple roses. 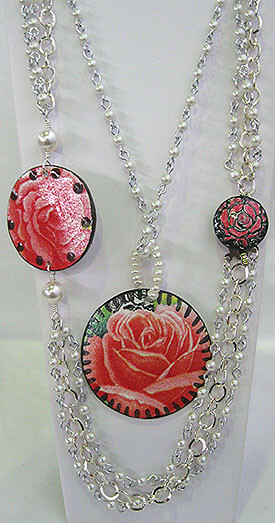 We decoupaged large 50" shells in this stunning rose pattern and handpainted the accents. 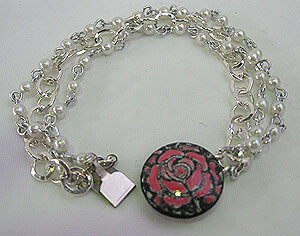 We added small white pearl and sterling silver plate chain to give this one a sweet touch.